Download this event budget template, customise it to the needs of your event, and take a breath. Step one is done. Preparing your event budget can feel like drowning in a sea of numbers. Are your estimations right? Should this expense go in this category, or this one? And, worst of all…did you forget something? When it comes to budgeting, simple is best. You want an event budget template that is easy to understand and can be edited on the fly so that no one on your team misses a beat. Download this budget template, customise it to the needs of your event, and take a breath. Step one is done. 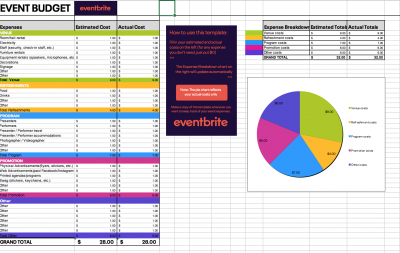 The first event budget worksheet is Budget Projected, aka, where you enter estimated costs for budget line items like venue rentals, food and beverage, guest presenters, marketing and miscellaneous event costs. The expense chart will break down your costs automatically with the data entered. Budget Actual is worksheet number two. Here, you repeat the process for worksheet one, inputting the confirmed amount for each line item. This should be the actual costs you will be invoiced for, including GST. The final worksheet is Budget Comparison, which features a side-by-side comparison of your projected versus actual budget costs, calculated automatically.